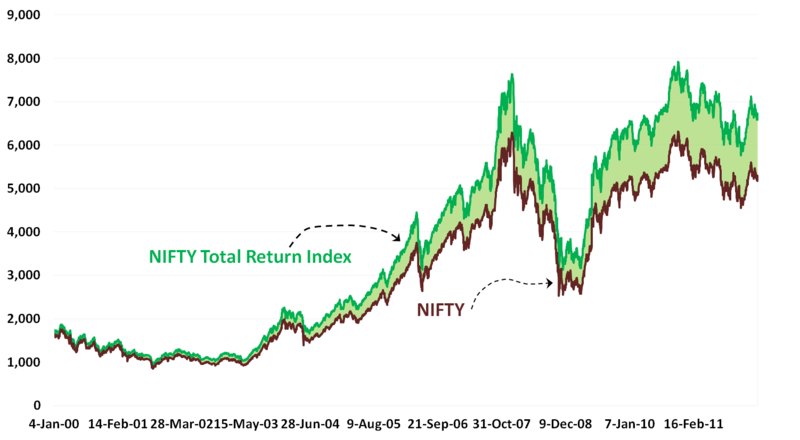 Dividends now represent 27% of the total return index of the NIFTY since the start of 2000. What this means is that assumming that the changes in index constituents are pari passu, if the dividends issued by the component companies of NIFTYwere reinvested/reconsidered back into the NIFTYcalculations then the value of the index would roughly be around 6,728 (27% more than the current NIFTY value of 5295, as at 1Apr’12). 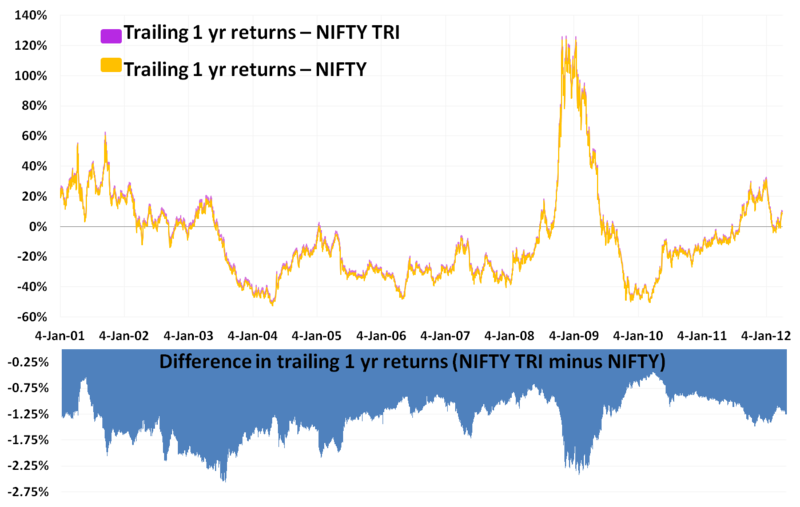 The Total Return Index (TRI) tracks the capital gains of the NIFTY stocks and assumes that any cash distributions, such as dividends are reinvested back into the index. The German stock market DAX is an example of a TRI while NSE distributes historical values of its TRI here. I downloaded NIFTY TRI and played around with the data trying to find some patterns and inferences. The first chart is a simple compare of the NIFTY TRI (dark green line) against the NIFTY (dark brown line) with the difference between them shaded in light green. The gap between the two indices is also shown in the second chart. I am unable to make any meaningful conclusion from this chart.